School Meals at St Dominic’s Catholic Primary School are cooked onsite in our own cooking kitchen which opened in September 2014. 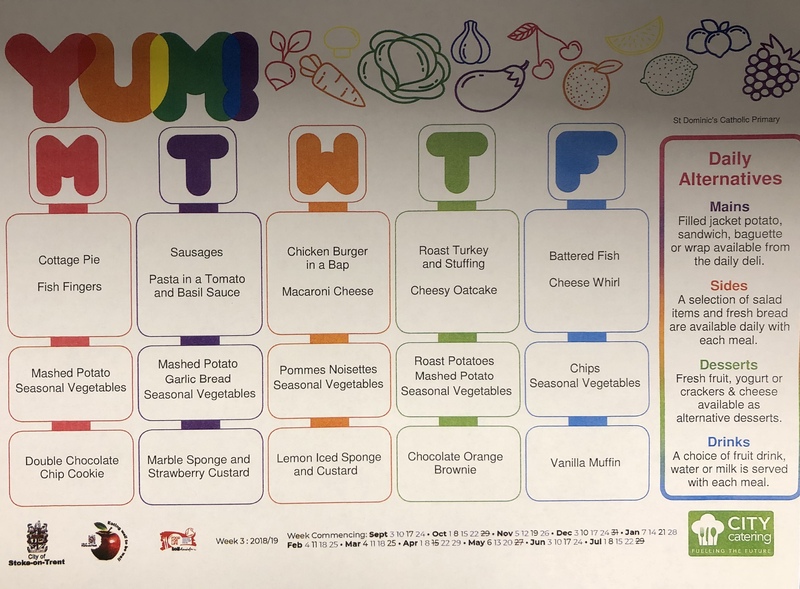 We are very proud of our new facilities and the fact that our children sit down to a nutritious, home cooked meal each day. 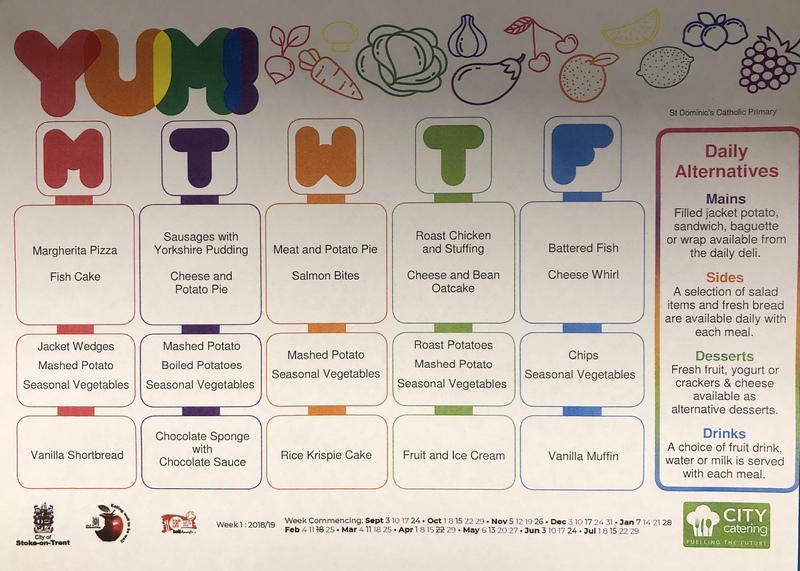 These meals are provided by City Catering, our in-house caterer, serving meals in schools across Stoke-On-Trent and parts of Staffordshire. City Catering’s fully-trained staff supply over 16,000 tasty home-made school meals daily,encouraging children to choose a balanced meal. Providing food which children want to eat is easy but we would be failing if we did not make sure that this food meets their present and future health needs. 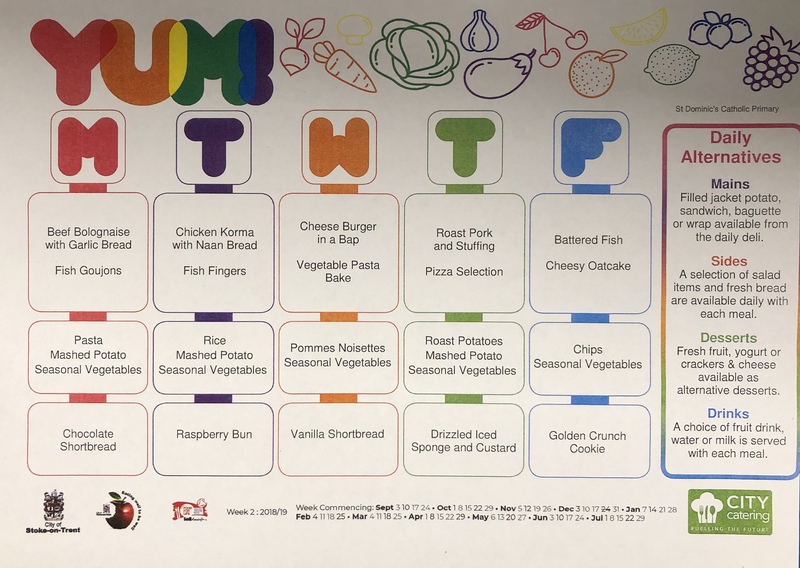 City Catering has been making changes to give children the best possible food choices during the school day, in line with present legislation for both food standards and nutrient guidelines. City Catering is delighted to announce they have been awarded the ‘Food For Life Silver’ Catering Award in the schools where they provide the catering, across Primary, Special and Nursery Schools. Achieving this award is recognition that the meals they provide are healthy, nutritious, and at least 75% home cooked. There are many other criteria which they have successfully met in achieving this award. All meat is Farm Assured, eggs are free range and fish is from sustainable stocks. Meals are good quality, healthy and ethically sourced. We don’t have to take their word for it, we can now see what they have achieved with this nationally-recognised quality standard. We are also very proud of the service that we provide – our take-up of meals is higher than the national average which is mainly due to the commitment and passion of our staff. We provide water, milk, milkshakes and pure fruit juice daily.